The canton of Thurgau (German: Thurgau (help·info), anglicized as Thurgovia) is a northeast canton of Switzerland. The population, as of December 2017[update], is 273,801. In 2007, there were a total of 47,390 (or 19.9% of the population) who were resident foreigners. The capital is Frauenfeld. 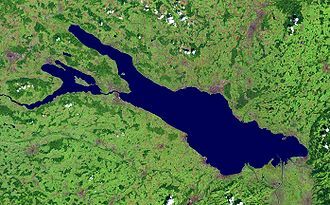 In prehistoric times the lands of the canton were inhabited by people of the Pfyn culture along Lake Constance. During Roman times the canton was part of the province Raetia until in 450 the lands were settled by the Alamanni. In the 6th century Thurgovia became a Gau of the Frankish Empire as part of Alemannia, passing to the Duchy of Swabia in the early 10th century. At this time, Thurgovia included not just what is now the canton of Thurgau, but also much of the territory of the modern canton of St. Gallen, the Appenzell and the eastern parts of the canton of Zurich. The most important cities of Thurgovia in the early medieval period were Constance as the seat of the bishop, and St. Gallen for its abbey. 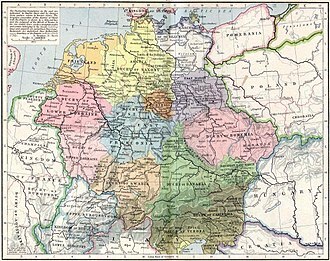 The dukes of Zähringen and the counts of Kyburg took over much of the land in the High Middle Ages. The town of Zürich was part of the Thurgau until it became reichsunmittelbar in 1218. [dubious – discuss] When the Kyburg dynasty became extinct in 1264 the Habsburgs took over that land. 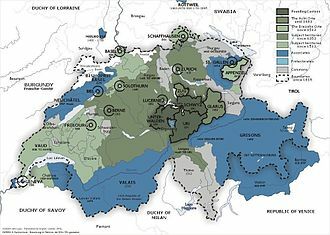 The Old Swiss Confederacy allied with ten freed bailiwicks of the former Toggenburg seized the lands of the Thurgau from the Habsburgs in 1460, and it became a subject territory of seven Swiss cantons (Zurich, Lucerne, Uri, Schwyz, Unterwalden, Zug and Glarus). During the Protestant Reformation in Switzerland, both the Catholic and emerging Reformed parties sought to swing the subject territories, such as the Thurgau, to their side. In 1524, in an incident that resonated across Switzerland, local peasants occupied the cloister of Ittingen in the Thurgau, driving out the monks, destroying documents, and devastating the wine-cellar. 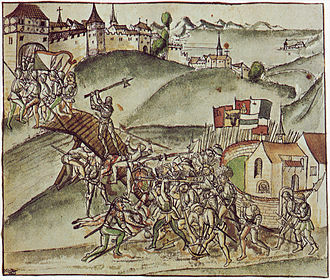 Between 1526 and 1531, most of the Thurgau's population adopted the new Reformed faith spreading from Zurich; Zurich's defeat in the War of Kappel (1531) ended Reformed predominance. Instead, the First Peace of Kappel protected both Catholic and Reformed worship, though the provisions of the treaty generally favored the Catholics, who also made up a majority among the seven ruling cantons. Religious tensions over the Thurgau were an important background to the First War of Villmergen (1656), during which Zurich briefly occupied the Thurgau. In 1798 the land became a canton for the first time as part of the Helvetic Republic. In 1803, as part of the Act of Mediation, the canton of Thurgau became a member of the Swiss confederation. The cantonal coat of arms was designed in 1803, based on the coat of arms of the House of Kyburg which ruled the Thurgau in the 13th century, changing the background to green-and-white, at the time considered "revolutionary" colours (c.f. tricolour); as the placement of a yellow (or) charge on white (argent) is a violation of heraldic principles, there have been suggestions to modify the design, including a 1938 suggestion to use a solid green field divided by a diagonal white line, but they were not successful. The current cantonal constitution of Thurgau dates from 1987. To the north the canton is bound by the Lake Constance across which lies Germany (Baden-Württemberg and Bavaria) and Austria (Vorarlberg). The Rhine creates the border in the northwest. To the south lies the canton of St. Gallen; to the west lie the cantons of Zürich and Schaffhausen. The area of the canton is 991 km2 (383 sq mi) and commonly divided into three hill masses. One of these stretches along Lake Constance in the north. Another is further inland between the Thur and the river Murg. The third one forms the southern border of the canton and merges with the Hörnli mountain in the pre-Alps. The population of the canton (as of 31 December 2017) is 273,801. The canton is mostly German speaking. The population (as of 2000[update]) is split between Protestants (45%) and Roman Catholics (36%). Since January 2011, Thurgau has been divided into five districts which are named after their capitals. Before this date, there were eight districts - (Steckborn District, Bischofszell District and Diessenhofen District formed their own districts with their surrounding municipalities). The canton of Thurgau is known for its fine agricultural produce. Particularly, apples, pears, fruits and vegetables are well-known. The many orchards in the canton are mainly used for the production of cider. Wine is produced in the Thur valley. There is also industry in the canton of Thurgau. The main industries are printing, textiles and handicrafts. Small and middle-sized businesses are important for the cantonal economy. Many of these are concentrated around the capital. ^ Federal Department of Statistics (2008). "Ständige Wohnbevölkerung nach Staatsangehörigkeit, Geschlecht und Kantonen" (Microsoft Excel). Retrieved 5 November 2008. ^ Federal Department of Statistics (2004). "Wohnbevölkerung nach Religion" (Interactive Map). Retrieved 2009-01-15. ^ "Liste officielle des communes de la Suisse - 01.01.2008". Office fédéral de la statistique. Retrieved 15 December 2008. Wikimedia Commons has media related to Canton of Thurgau. Reformed worship is religious devotion to God as conducted by Reformed or Calvinistic Christians, including Presbyterians. Despite considerable local and national variation, public worship in most Reformed, huldrych Zwingli, who began his reforming work in Zurich in 1518, introduced many radical changes to worship. His Sunday service, instituted in 1519, was derived from a liturgy called Prone. He limited worship to preaching, the Eucharist, John Oecolampadius, in Basel, believed that while the Bible did not give detailed liturgical instruction, all worship must be guided by biblical principles. For him this meant that worship should be simple and unpretentious, John Calvins ideas about worship were influenced Martin Bucer and William Farel during his time in Strasbourg beginning in 1538. When he came to Geneva in 1536, Farel had already begun a Zwinglian reformation and his liturgy emphasized the unworthiness of the worshiper with the Ten Commandments being sung every Sunday, a practice probably taken from Martin Bucer. The service was very didactic, with even the prayers written with the intention to instruct. Calvin did not insist on having explicit biblical precedents for every element of worship, the liturgy was entirely in the vernacular, and the people were to participate in the prayers. Calvins Geneva became the model for all continental Reformed worship, Dutch Reformed churches developed an order of worship in refugee churches in England and Germany which was ratified at synods in Dordrecht in 1574 and 1578. 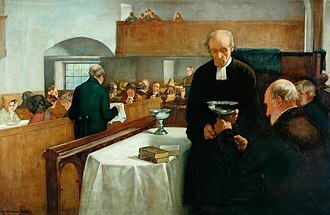 The form emphasizes self-examination between the words of institution and communion consisting of accepting the misery of ones sin, assurance of mercy, Knox wrote a liturgy for the newly founded Church of Scotland based on John Calvins liturgy. Knoxs liturgy set a structure for worship in Scotland, though ministers could improvise, following to the Union of the Crowns in 1603, the English made several attempts to impose the Book of Common Prayer on the Scots, which they fiercely resisted. They sought to rid worship of any element not specifically prescribed in the Bible and they favored liturgical decisions to be made at the lowest level possible, rather than by a regional or national authority. Frauenfeld is the capital of the canton of Thurgau in Switzerland. The official language of Frauenfeld is German, but the spoken language is the local variant of the Alemannic Swiss German dialect. The earliest trace of settlement are several La Tène era graves to the east of Langdorf. The Roman road from Oberwinterthur to Pfyn ran through what is now the Allmend in Frauenfeld, two Roman villas were discovered in Thalbach and Oberkirch. The villa seems to have become the point of the settlement of Oberkirch. On the ruins of the villa, an Early Middle Ages cemetery was built, and by the 9th century, the Oberkirch church was built. Perhaps as a result of donation in the 9th century, or more likely a donation in the 13th century. Erching had a house, twelve houses, at least one mill. In the 13th century, Erching formed a self-contained manor farm complex and was occupied by a Habsburg Vogt after in 1270, starting in the late 12th century, a village grew up in the area around Erching and another grew up around the church at Oberkirch. By the end of the 1220s, a tower with a mill and chapel were built. This village, which would become Frauenfeld, grew gradually on land owned by Reichenau Abbey, the original fortified tower grew into Frauenfeld Castle. Frauenfeld is first mentioned in 1246 as Vrowinvelt though it had been growing slowly during the third of the 13th century. The village was inhabited by the family of Hörigen and several other knightly families who were allied with the Habsburg and Kyburg families. 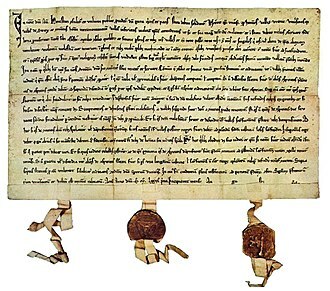 In 1246 a knight with the last name/title zum Kyburger Umfeld is first mentioned in Frauenfeld, in the next three decades, several knights who came from the Kyburg lands, adopted the von Frauenfeld name. It is unclear whether the inhabitants of Frauenfeld Castle were simply the aristocratic owners of houses in Frauenfeld or the administrator of the bailiwick of Frauenfeld, in 1286 Frauenfeld is first mentioned as a city. 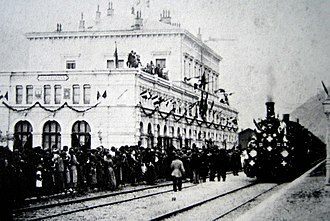 At least by that date, it had integrated into the Habsburg territories. The tower was for a time in the hands of the Knights of Frauenfeld-Wiesendangen. The counts of Toggenburg ruled the Toggenburg region of today’s canton of St. Gallen and adjacient areas during the 13th to 15th centuries. A baronial family of Toggenburg is mentioned in the 11th and 12th centuries and they are named for their ancestral seat, now known as Alt-Toggenburg, near Kirchberg, St. Gallen. The family is attested from the early 13th century, as Toccanburg, Diethelm I was followed by Diethelm II. 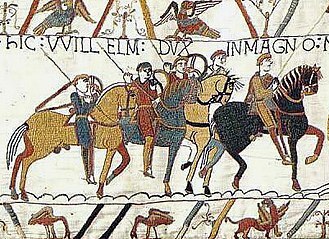 Either of these was the beneficiary of the inheritance of a number of noble families in c.1200. In 1187, one Werner of Toggenburg became abbot of Einsiedeln, the legend of a Saint Idda of Toggenburg is recorded in 1481, making her the wife of a count of Toggenburg, possibly either Diethelm, or one Heinrich. According to the legend, the husband defenestrated his innocent wife on suspicion of adultery and she survived and lived as an anchoress in Fischingen. Her veneration there is attested for 1410, the early counts were in competition with St. Gallen Abbey, the bishops of Constance and the counts of Kyburg. One of the few remaining tomb stones of the Toggenburg family, Toggenburgergruft beneath the present entrance area of the Rüti church.